Book NewsBuildyourwritinglifeIndulgeinbooksIndulgeinwritingInformation for new writers. Irish writer Sharon Thompson’s debut novel ‘The Abandoned’ launched on Thurs 25th Jan 2018 at #1 on Amazon and now she will have her second novel ‘The Healer’ published a year later, in January 2019. On pre-order kindle sales, ‘The Abandoned’ dominated the Irish crime category and was a number one best-seller. Available in paperback and kindle on Amazon, this gritty crime novel, was also made into an audio book. Bookshops, Liber in Sligo, Supervalu in Carndonagh and Farrens Moville, stock signed copies. 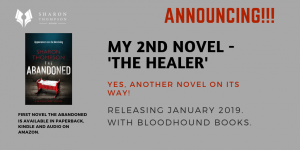 ‘The Healer’ takes one of the characters from ‘The Abandoned’ called Molly McCarthy and tells her story. Molly is a child in 1940s Ireland with the ability to see her guardian angels, and has gifts as a healer. However, she has learning difficulties and is feared as a ‘half-wit’ by her family and Sligo community. Conflict and abuse follow Molly. Her mother, Nancy, resents her gifts and also the stigma of having an unusual child. Molly’s father Michael, and his brother Vincent, sexually abuse Molly. She finds it difficult to express herself, but she does have silent insights into the world around her. Following Molly’s life, The Healer explores one little girl’s journey through the darkness around her. Will she listen to her guardian angels? Can she heal herself and find a safe home? Will she find love and survive a world of crime, immigration and violence? Will The Healer ever be healed? The Abandoned is available to purchase online on Amazon in paperback and kindle. Signed copies are sold locally.